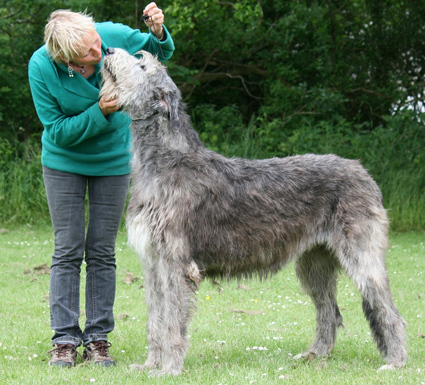 The Wolfhound is just as lovely as it is big! 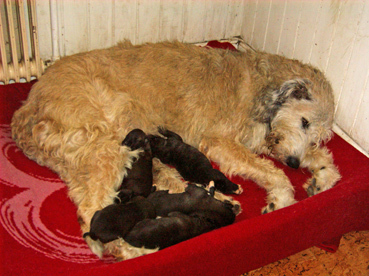 The Irish Wolfhound is one of the world's largest breed of dogs - the gentle giant! A lovely, kind and calm companion. From an old saying: "Gentle when stroked, fierce when provoked"! The Wolfhound is often quite lazy, but likes and needs the daily excercise, specially when weather is not too hot. 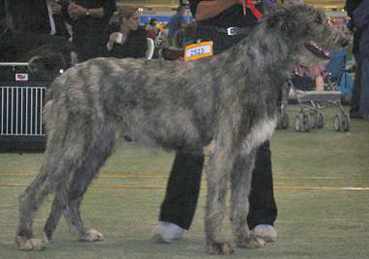 The Irish Wolfhound has a rough haired coat, that is weatherproof and needs regular trimming and grooming. Most Wolfhounds like to spend plenty of time outdoors, preferably in good company! Dahmrak's Dejlige Denise from Sabine Hohenberger in Germany. So absolutely great, beautiful, strong, big, healthy and with so super in temperament as they can be! Denise won so much in quite a few shows: Int.Ch, DK Ch, SE Ch, N Ch, Lux.Ch, Nord.Ch. Breed winner Denmark ’04 and Copenhagen winner ’04. the result was a litter of five. One of her daughters, brindle Eikica Intriquiging Iris, stayed at home with me. 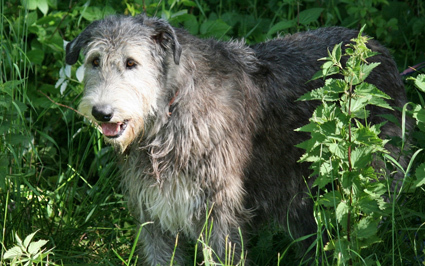 See our "Past and present wolfhounds"
Our Wolfhound garden party 2013 Back to welcome page.